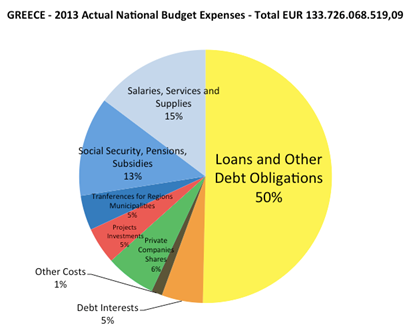 Greece is facing a huge debt problem and a humanitarian crisis. The situation now is many times worst than it was in 2010, when the Troika – IMF, EU Commission and ECB – imposed its “bailout plan”, justified by the necessity to support Greece. In fact, such plan has been a complete disaster for Greece, which has had no benefit at all out of the peculiar debt agreements implemented since. After five years, the banks got everything they wanted. Greece, instead, got into a real tragedy: the country has far deepened its debt problem, lost State assets as the privatization process was accelerated, as well as shrunk its economy drastically. Most of all, it has had an immeasurable social cost represented by the lives of thousands of desperate people who had their livelihood and their dreams impacted by the severe austerity measures enforced since 2010. Health, education, labour, assistance, pensions, salaries and all other social services have all been destructively affected. Source: Εισηγητική Έκθεση Απολογισµού και Ισολογισµού 2013 – p. 90. Elaborated by Stavros Papaioannou. In one shot, justified by the necessity to “preserve financial stability in Europe”, illegal measures were taken in May 2010, in order to provide the apparatuses that would allow the private banks to get rid of the dangerous “bubble”, i.e., the great amount of toxic assets – mostly dematerialised and non marketable assets – that loaded their off-balance  sheets accounts. The main objective was to help the private banks to transfer such problematic assets to the European countries. One of the measures adopted to accelerate the exchange of assets from private banks and settle the bank crisis was the SMP program , which allowed the European Central Bank (ECB) to do direct purchases of public and private debt securities on primary and secondary markets. The operation related to public debt securities is illegal under Article 123 of the EU Treaty . This program is one among several “non-standard measures” then taken by the ECB. The creation of a “Special Purpose Vehicle” company based in Luxembourg was another very important measure to help transfer dematerialised toxic assets from the private banks into the public sector. Believe it or not, the European countries  became “partners” of this private company, a “societé anonime” called European Financial Stability Facility (EFSF) . The countries committed with billionaire guarantees, which was initially set on the amount of EUR 440.00 billion  and then, in 2011, was raised to EUR 779.78 billion . The real purpose of this company has been shadowed by the announcements that it would provide “loans” to countries, based on “funding instruments”, not real money. Utterly, the creation of EFSF was an imposition from IMF , which gave it a support of EUR 250 billion . The exchange of toxic assets from private banks to a company through simple transference, without payment and a proper buy/sell operation would be illegal according to the accountability rules . EUROSTAT changed these rules and allowed, “liquidity operations conducted through exchange of assets”, justifying it by the “specific circumstances of the financial turmoil”. The main reason the EFSF was based in Luxembourg was to escape from being submitted to international laws. Besides, the EFSF is also financed by the IMF, whose collaboration would be illegal, according to its own statutes. Although, the IMF also changed its rules in order to provide the EUR 250 billion collaboration to EFSF . The Bank of Greece annual report shows an immense increase of the “off-balance” accounts related to securities in 2009 and 2010, on amounts much greater them the total assets of the Bank, and this pattern continues on the following years. For example, on the Bank of Greece 2010 Balance Sheet  , the total of assets in 31/12/2010 was EUR 138.64 billion. The off-balance accounts on that year reached EUR 204.88 billion. In 31/12/2011 , as the total balance assets summed EUR 168.44 billion; the off-balance accounts hit EUR 279.58 billion. 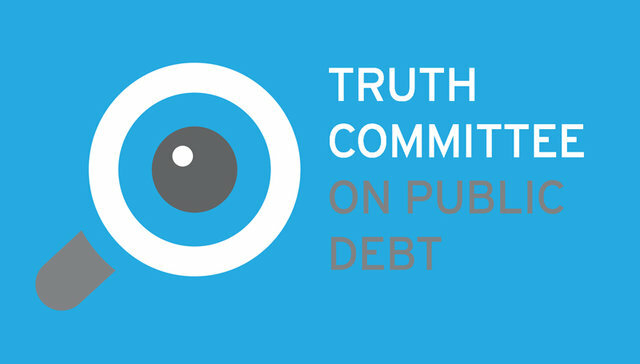 National Coordinator of Citizen Debt Audit in Brazil (www.auditoriacidada.org.br), invited by the president of Greek Parliament MP Zoe Konstantopoulou to collaborate with the Truth Committee on Public Debt created in April 4, 2015. EUROPEAN COMMISSION (2010) Communication From the Commission to the European Parliament, the European Council, the Council, the European Central Bank, the Economic And Social Committee and the Committee of the Regions – Reinforcing economic policy coordination. 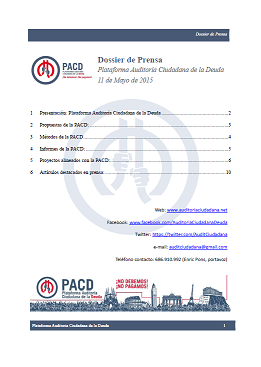 http://www.efsf.europa.eu/about/index.htm and http://www.efsf.europa.eu/attachments/faq_en.pdf – Question A9 [Accessed: 3 June 2015]. http://www.efsf.europa.eu/attachments/faq_en.pdf – Question A6. [Accessed: 4th June 2015]. 9/10 MAY 2010 – Council Conclusions – Extraordinary meeting – Under the justification of the “crisis in Greece”, the scheme measures to rescue banks are implemented.